A list, available via the button added to the browsing bar, shows the latest significant earthquakes and is updated in real time. 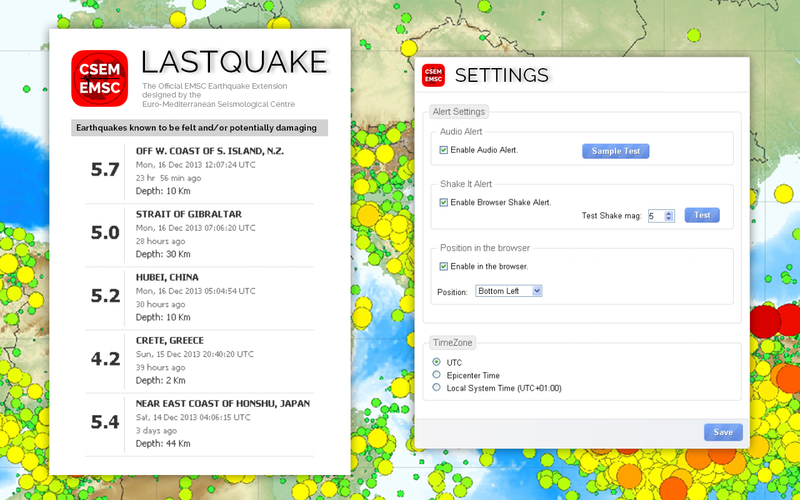 A thin thumbnail is always visible on your browser that shows the latest significant earthquakes. The user can set the position of the thumbnail on his browser. A click on the thumbnail leads to the web page dedicated to this earthquake. The user can be notified of a new significant earthquake by an audible or a visual notification. These notifications can be tested and activated/deactivated via the “Settings” panel available via the button in browsing bar. Report bugs to along with your O.S. and browser versions. Improvement of the warning screen part. Adding possibility to hide the screen alert. Waiting for the full load of the audio alert before playing.